With 10 DECnet nodes connected to the global hobbyist HECnet network stable and staying up, I started to wonder what other non-Internet Protocol (non-TCP/IP) networking experiment I could run. Apple's classic AppleTalk protocol came to mind. Originally released as AppleNet in 1983 for the Apple II and Lisa, AppleTalk has roots in Xerox XNS. AppleTalk's ancestry is no less illustrious than DECnet. Despite phenomenal rise of the Internet Protocol (TCP/IP), AppleTalk was supported all the way to the 2009 release of Mac OS X Snow Leopard. Interoperability with TCP/IP was introduced as far back as 1988 with MacTCP and later MacIP (Wikipedia) which basically piggybacked IP over AppleTalk. However, my objective here was to stay away from IP completely, and focus on pure AppleTalk. I had zero experience with AppleTalk networking. Fortunately, there is still enough reading material out on the 'net to get a feel for it. "Inside Macintosh: Networking" is a great book. The Netatalk 2.0 documentation is fabulous. And Cisco's Protocol Filter appendix is handy in deciphering stuff like 0x809b ether-type packets that suddenly pop up in packet dumps once AppleTalk kicks in. 0x809b is EtherTalk, "an Apple AppleTalk networking protocol that enables AppleTalk to communicate over Ethernet cabling." A note of caution: I had initially grabbed and built Netatalk 3.0 from source, but fell back to Netatalk 2.0 because support for AppleTalk was discarded in Netatalk 3.0. There is some documentation here and here which boil down to the following. 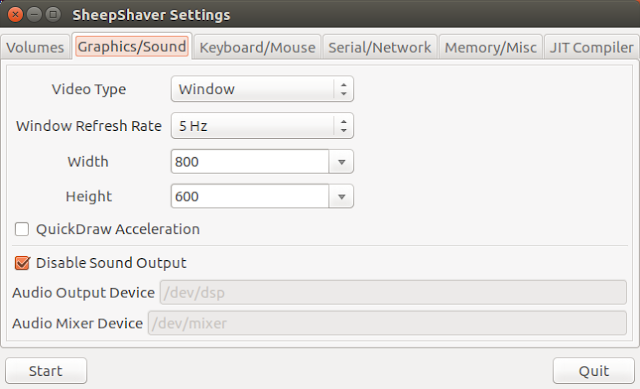 The Ubuntu version I built and run SheepShaver on is Ubuntu 17.04. First, make sure the required packages are installed. 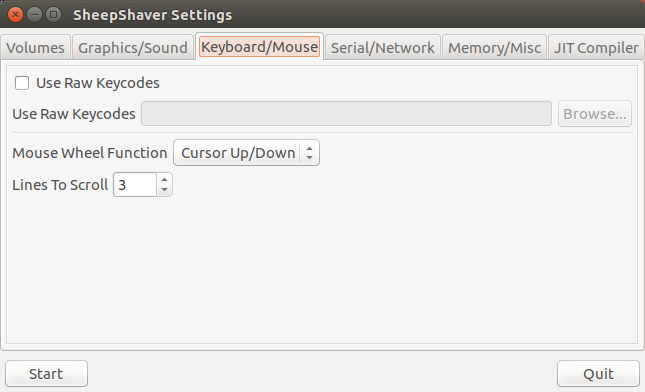 The following script fetches the SheepShaver source code and builds it. 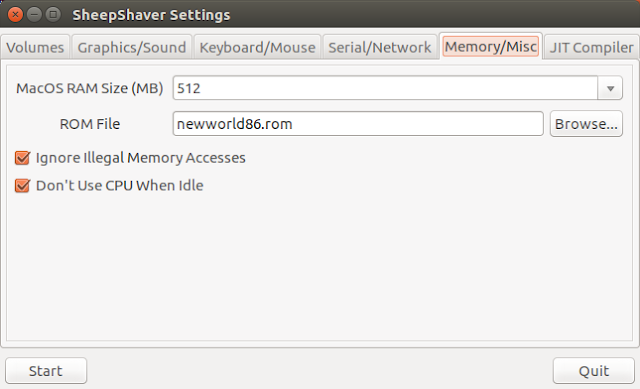 Once the main SheepShaver program has been built, the following script builds the sheep_net.ko kernel module. I created a directory ~/sheepshaver.run/ and copied over the SheepShaver binary from the build location (~/sheepshaver.build/macemu/SheepShaver/src/Unix/SheepShaver). I then looked around the internet to locate a "New World" ROM (newworld86.rom) and a Mac OS 9 bootable installer image (Mac OS 9.toast). 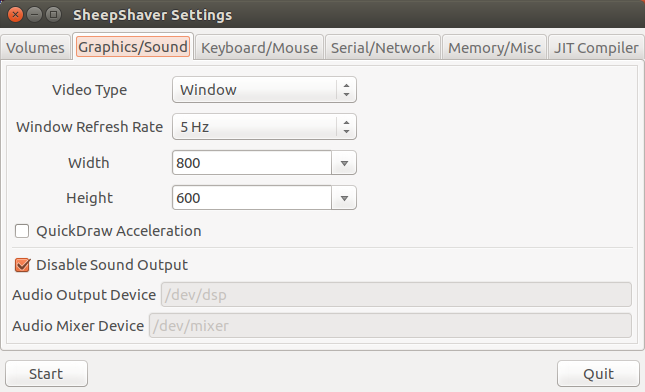 There are pointers to where they can be obtained from at "Setting up SheepShaver for Mac OS X". I placed both these items in the same directory as the SheepShaver binary. I created a subdirectory called "shared" to share files between the Ubuntu host and SheepShaver's Mac desktop. This directory is configured to be the "Unix Root" on SheepShaver and shows up as the drive "Unix" on the virtual Mac desktop. It simplifies transfer of files between Ubuntu host and Mac OS 9 virtual machines guest; anything copied into "shared" shows up in the "Unix" drive on Mac OS desktop though they cannot be executed directly from there, requiring me to copy executable installers from "Unix" to a local place on Mac OS first. When the "Start" button is clicked, SheepShaver saves the configuration out to a dotted (hidden) text file called ".sheepshaver_prefs" in the home directory, i.e. 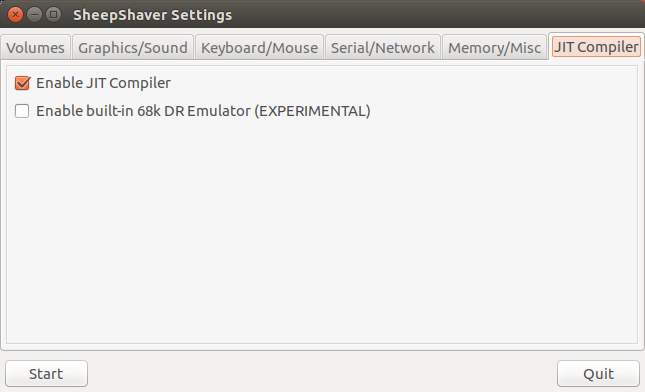 "~/.sheepshaver_prefs". It then launches the virtual Power Macintosh and boots from the CD image. I use the following script to start the Mac OS 9 SheepShaver application with the X11 GUI going to a detached virtual X11 display screen using the "xpra" tool. As expected for new disks, the installer asks to initialize them. I decided to initialize the two disks with "Mac OS Extended" file system instead of the default "Mac OS Standard". It appears from the literature around the internet that "Mac OS Extended" is actually a journaling file system with better performance for normal use. More importantly, the "Update Apple Hard Disk Drivers" checkbox in the "Options" screen accessible via the "Options..." button needs to be unchecked (cleared) for successful SheepShaver installation; SheepShaver hangs if this button is checked. As far as "Customize" is concerned, I pretty much selected everything except Speech-related features. I then proceeded with the installation by clicking "Start". Once installation completed (it takes about 7 - 8 minutes), I shut Mac OS 9 down and restarted SheepShaver to get back to the launcher options GUI. I then removed the CD ROM from the list of volumes and booted up Mac OS 9 from the hard disk. On booting up the first time after installation, Mac OS 9 presents a "Mac OS Setup Assistant" window. It is very important the Setup Assistant be not used; all configuration can be done separately using the various Control Panels reachable via the Apple logo at the top left. Mac OS Setup Assistant hangs SheepShaver, close it immediately! 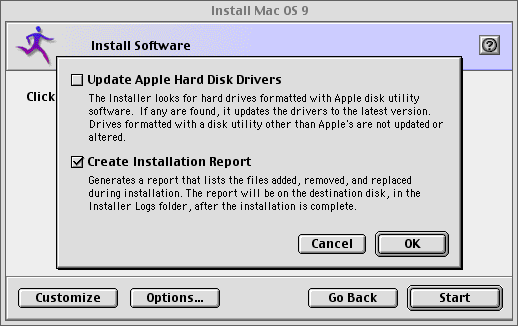 That completes the base installation of Mac OS 9 on SheepShaver, ready to be configured for its networking features. Here are a couple of more screenshots. Mac OS 9 in SheepShaver needs to have an IP address, netmask and gateway configured, and the configured Gateway needs to be reachable, to not freeze and stay up even if we are using only AppleTalk. It does not matter if the configured IP Gateway actually connects to the internet or anything at all; as long as Mac OS 9 can see it, it is happy. I used the TCP/IP control panel to configure a dummy IP address, subnet mask, router (Apple speak for Gateway) and Name server (DNS). Then I assigned the router and DNS address configured in Mac OS 9 to a different plug on the same VDE switch on the Ubuntu host so that Mac OS 9 can see the IP gateway. There is no IP traffic after a few initial startup packets. I did not have to do much else in terms of preparing for AppleTalk; it did really work "automagically" as claimed once Netatalk was configured on the Ubuntu host. Unfortunately my total ignorance of AppleTalk resulted in spending significant time in numerous false starts before everything fell into place. One of the bigger mistakes I made was to download and build Netatalk 3.0 from source, only to realize later that they completely took out support for AppleTalk in Netatalk 3.0 onwards. There is no AppleTalk router in my setup. All AppleTalk nodes are plugged into the same VDE virtual switch. Also, there is no AppleTalk Zone Name required or specified; there is only one zone which is also the default zone. Ultimately what worked was a straight-forward installation from standard Ubuntu repository which pulled in Netatalk version 2.2.5 (on Ubuntu 17), and edits to just four files. To use the AFP file server, I enabled both the cnid_metad and afpd daemons. Since I am only interested in AppleTalk, I enabled the atalkd, papd and timelord "legacy" daemons but left the a2boot daemon disabled because I have no need for netbooting. 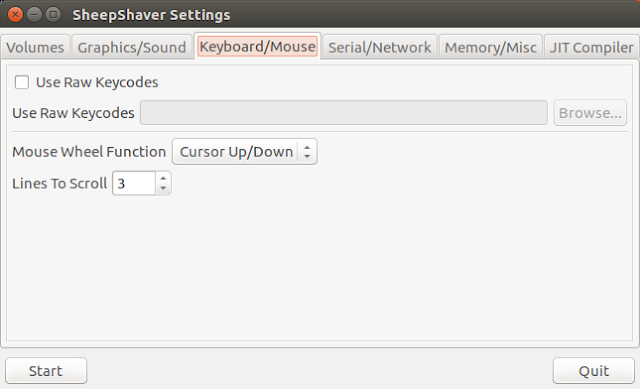 Here is /etc/default/netatalk configuration file from MOKSHA which is the Ubuntu 17.04 host machine for SheepShaver. 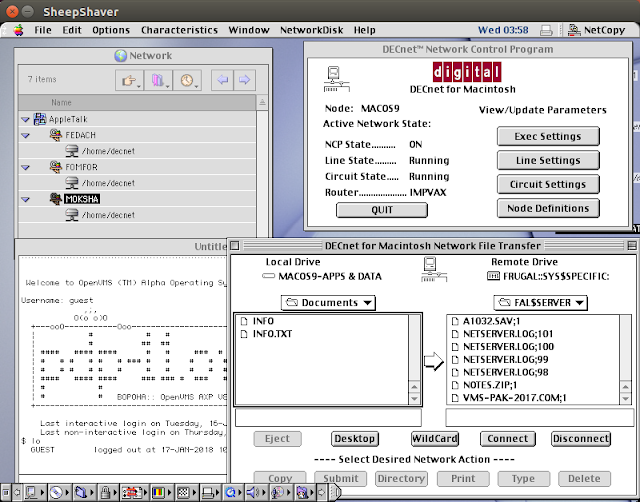 The virtual Ethernet card on my SheepShaver configuration is connected to a plug on a Virtual Distributed Ethernet (VDE) switch running on MOKSHA which also happens to host four more virtual machines that communicate over DECnet. All I needed to do with atalkd.conf is stick in the name of a hitherto unused VDE plug network device, just by itself, on the last line. Netatalk actually modifies this file on startup with a startup AppleTalk net-range and a self-generated node number (which it decides on "automagically" based on what it can see on the network) and adds those items to the configuration itself. Here is my atalkd.conf from MOKSHA after being modified by Netatalk. 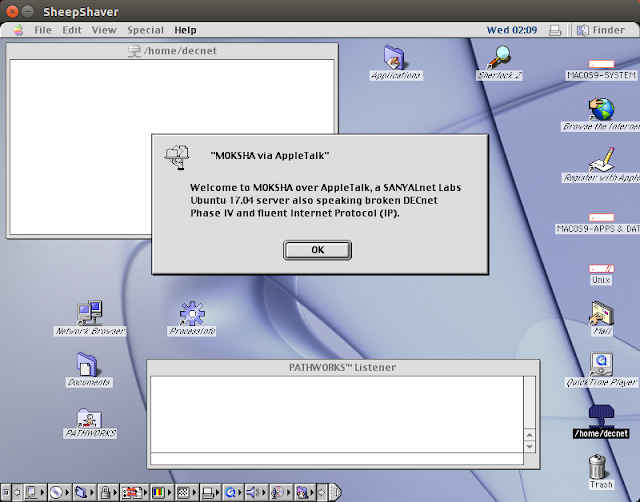 This file configures file-sharing between Ubuntu and Mac OS 9 over AppleTalk. Interested only in AppleTalk, I disabled TCP and enabled DDP ("Datagram Delivery Protocol") that is part of the AppleTalk stack. I also enabled guest access requiring no authentication and a "welcome" message that is displayed when a guest connection is established to Ubuntu from Mac OS 9. The Ubuntu directory made available publicly to Mac OS 9 over AppleTalk is actually configured in the next file. Here is my afpd.conf file. This file defines the directories to be shared by Ubuntu over AppleTalk for Mac OS clients. I configured just one directory to be shared with Mac OS. (I have a lofty goal of making this directory available over the FAL service of DECnet as well, hence the name). Here is my AppleVolumes.default configuration file. Of course, the netatalk service has to restarted using the standard Ubuntu systemctl (or service on Ubuntu 14) tool for configuration changes to take effect. 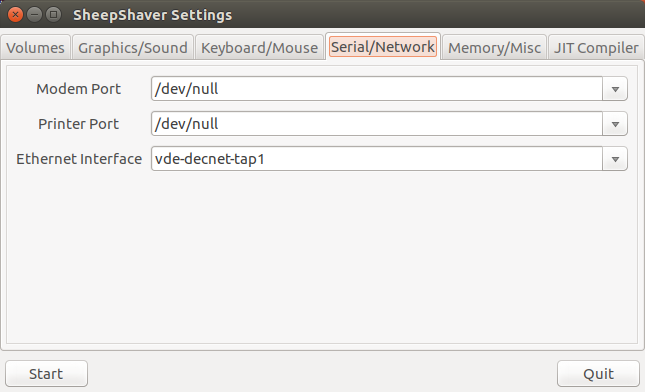 Also, netatalk has to be enabled for starting up at boot using systemctl (or update-rc.d on Ubuntu 14). With the Ubuntu 17 host and SheepShaver Mac OS 9 communicating successfully over AppleTalk at this point, I added two more Ubuntu 14 nodes FEDACH and FOMFOR into the AppleTalk mix. They were already bridged into the DECnet VDE switch that I am using for AppleTalk too. Once again I simply used Ubuntu's standard apt-get command to install Netatalk from the repos. FEDACH, FOMFOR and MOKSHA have identical /etc/default/netatalk and /etc/netatalk/AppleVolumes.default configuration files. 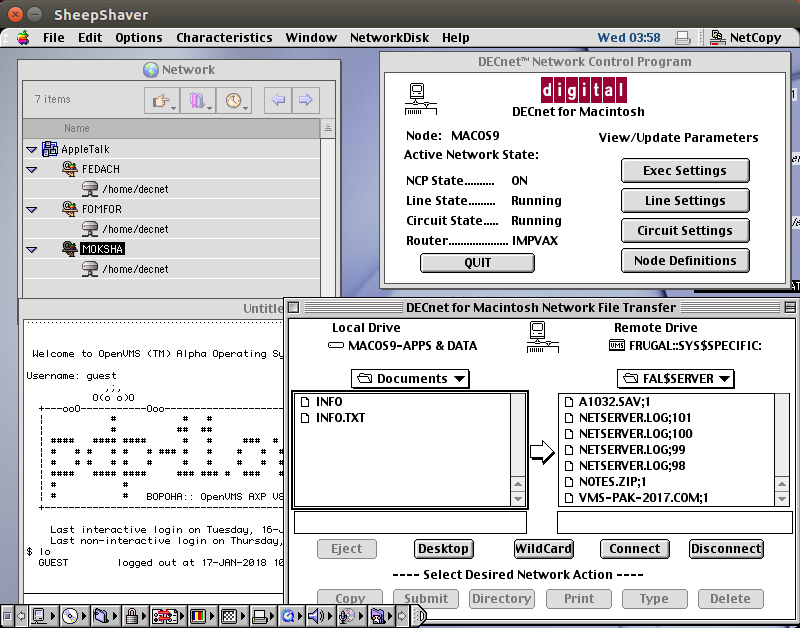 "FEDACH" -ddp -notcp -uamlist uams_guest.so -loginmesg "Welcome to FEDACH over AppleTalk, a SANYALnet Labs Ubuntu 14.04 server also speaking DECnet Phase IV and Internet Protocol (IP)." "FOMFOR" -ddp -notcp -uamlist uams_guest.so -loginmesg "Welcome to FOMFOR over AppleTalk, a SANYALnet Labs Ubuntu 14.04 server also speaking DECnet Phase IV and Internet Protocol (IP)." Moving on from AppleTalk, I went ahead to install DEC Pathworks for Macintosh and added DECnet support to Mac OS 9, thus having Mac OS 9 talking both AppleTalk and DECnet. But DECnet for Macintosh and Pathworks for Macintosh are the subjects of a separate post that I will get to some time! If it is up, you can see this Mac OS 9 virtual machine on HECnet. I have sheepsaver, but need an incoming telnet connection. Slirp does not have this ability I believe, or I'm not smart enough to make it work. 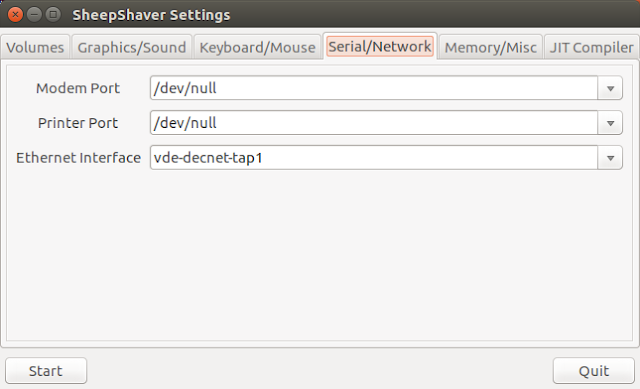 Networking using the host's adapter works fine on Linux and Windows. emailing you.